Self Spinal Manipulation – I “crack” my own neck, what more can a Chiropractor do? Spinal Adjustment: is administered by a Chiropractor to move a specific vertebra back into alignment. Spinal Manipulation: is often used as a synonym to “spinal adjustment,” but technically, this is a more gross manual mobilization of spinal segments. This approach often lacks specificity in the vertebra(e) that is/are moved. Lots of people “crack” their own necks; sometimes for relief, sometimes for dramatic effect, sometime just because they can, often without trying to. It can be called “self manipulation,” the “self adjustment,” the “self mobilization or the “do-it-yourself chiropractor.” Some people simply call it “addicted to crack.” But what is the difference between “cracking” it yourself and a Chiropractor’s spinal adjustment? If you feel the need to “crack” or “pop” your own neck or back is potentially a sign of an underlying problem. Often the need to do it stems from poor posture and/or a misaligned vertebra putting excess stress on the joints in the cervical (neck) spine. Due to the stresses on the spine, the joints become restricted and uncomfortable. If self-spinal manipulation becomes an on-going habit then, it may get to the stage of a trapped nerve! When you crack your own neck (self-spinal manipulation) you are mostly ‘cracking’ either the joint above or below the restricted one that needs to move properly. 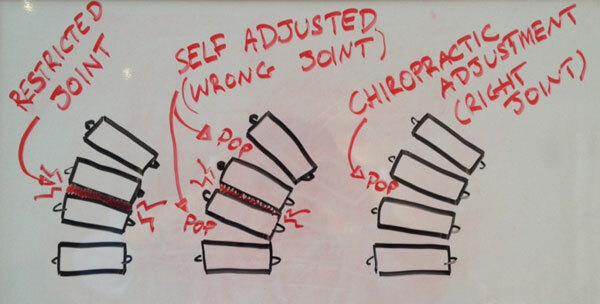 Chiropractors train over 4-5 years in Chiropractic College after undergraduate training to adjust the right joint in the right way (see picture below). This relieves the restricted joint and frees up any “trapped” or “pinched” nerves. When a joint is restricted, this makes the joints above and below work harder to compensate for the lack of movement in the stiff joint. So these joints are moving too much already and when you self adjust you are forcing them to move even further (see picture). Over time, this can cause stretching of the ligaments that support the spine and lead to instability and future problems. So what should I do if I frequently “crack” my own neck? From what we have learned so far, you potentially have an underlying problem and are causing damage to the ligaments of your spine. The first thing is to modify your posture to prevent unnecessary stress on your neck and shoulders (This could be as simply as adjusting the height of your computer monitor). The next thing is to have a full examination with a Chiropractor to assess the movement and function of the individual joints of the spine. The Chiropractor will then be able to recommend stretches, posture evaluation and advice, and, if necessary, a course of specific Chiropractic adjustments to restore the correct movement to the spine. What is the Science that explains the “cracking,” “clicking” or “popping” noise? Cavitation is a common term used by chiropractors and the cracking sound you may hear when having a chiropractic adjustment. It is a result of a force causing a temporary vacuum within the joint, which then collapses and causes a clicking noise. Gas bubbles within any joint fluid can also cause this snapping noise. What are common symptoms that accompany clicking neck or cracking neck? Pain at the back of the head or neck pain that radiates to the temples or forehead. 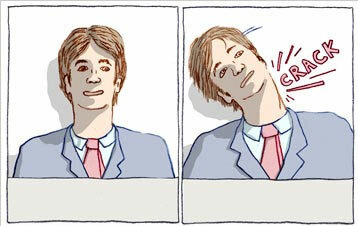 Muscle ache and tenderness when touching or pressing on the neck muscles. Arm numbness or tingling as a result of a ‘pinched nerves’ or cervical spondylosis which may develop due to prolonged neck muscle spasm or age respectively. Stiffness or a ‘hard’ lump is sometimes felt at the site of the muscle spasm. Redness is sometimes noticeable on the skin around the knot in the muscle and can be more prominent after a hot shower. What should I do if my neck cracks, creaks or pops frequently or I feel the urge to pop my own neck? Understand that cracking your joints does not necessarily signal a spinal adjustment. A lot of people will mistake the cracking sound for an actual adjustment. This is not necessarily the case (often, it’s not the case). In order to get a spinal adjustment, visit a licensed chiropractor. If you are having frequent feelings that something is not right in your neck or back then get a complete chiropractic evaluation. It is important to have a complete evaluation to rule out underlying pathologies and complicating factors, before any treatment is given. If you feel the need to crack your own neck or back, then this is a warning sign that something abnormal is happening that needs a complete evaluation to identify the root of the problem. Call your Maitland Chiropractor today for an evaluation.